In pride of place on a corridor wall at Whitchurch High School in Cardiff can be found the most extraordinary collection of sporting memorabilia. There are medals, trophies and awards won by former pupils in everything from football, rugby, cricket and hockey to lawn bowls. There is a framed shirt worn by the captain of the British and Irish Lions, another by a serial winner of the Champions League, another by a Commonwealth Games gold medallist. But even among such a jostling display of excellence, prominent space will be found should Geraint Thomas, another old boy, this weekend be awarded the most illustrious of all sporting outfits: the winner’s top from the Tour de France. Thirteen pupils in one year group alone achieved international sporting recognition. Thomas was in the year ahead of that group, already earmarked while at school as a cycling prodigy. With luck, Geraint Thomas will finish today’s stage having retained the yellow jersey, with tomorrow’s procession into Paris a mere formality. 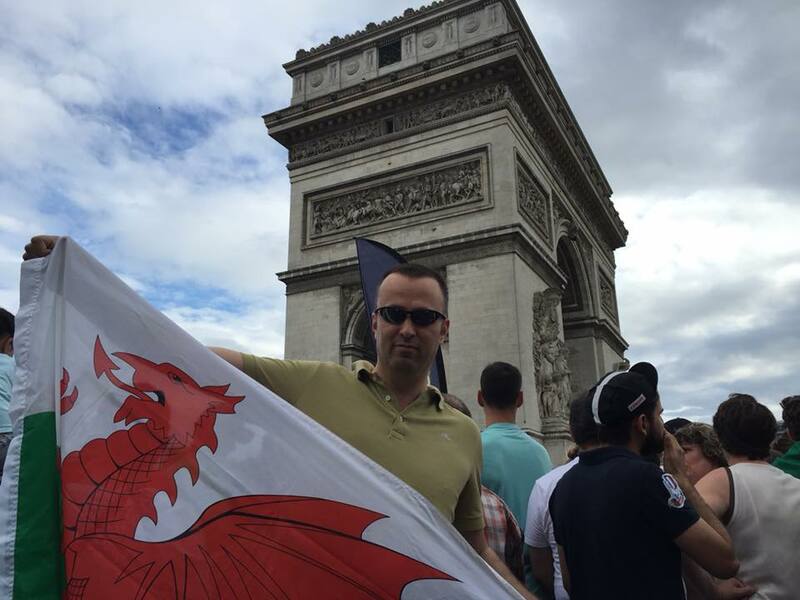 I think I might have to wander up to the Arc de Triomphe and wave my Welsh flag as he goes by, don’t you? I think you should. He’s won; its confirmed now, barring a meteor strike. Absolutely Tim. And take a selfie to share with us! Time to break out ‘Men of Harlech’ I reckon…. bicycles… fausands of them…. Watching him at the post-race press conference you’d have to have a heart of stone to not feel emotional. It’s a jersey. God, the Telegraph has gone downhill recently. There were several renditions of Delilah! And take a selfie to share with us! If you look at the English cricket team, just about everyone came out of an Independent school, even someone as thick as Alastair Cook. They are becoming, thanks to bursaries, the nurseries of sporting talent. I think even if Whitchurch High was a specialist sports school which spends millions on sporting talent, to have success like this is pretty staggering. How many TdF winners or Lions captains has Millfield produced? Two Welshmen in the all conquering Sky team ! When Bradley Wiggins won the Tour I didn’t think it could get any better, then Froome carried on winning, now a lad from Cardiff wins the Worlds greatest sporting event !